This is really great. I’m with Virginia, this actually makes me wish I had kids. Your daughter is lucky to have such a talented Mom, how cool to be creating heirlooms that will be cherished for years to come. Some day this will hang in her 5 year old’s room, or above her mantle. I am not usually so sentimental about art or family, but this is just wonderful. Well done. Fantastic art from both of you. A wonderful large stepping stone too. I’ve been meaning to make a mosaic of one of Nathan’s comic characters he’s made; one day! This reminds me of my daughters flutterbys. 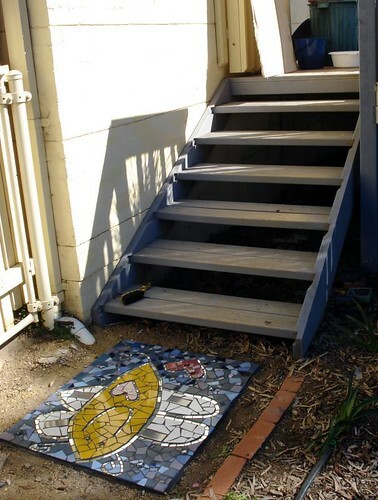 She is nine now and we have recently been discussing doing one of her flutterbys on a stepping stone at the front of our place. This is just the inspiration I needed. It’s wonderful. Thanks Kim. I absolutely love it! And I really must do some of Isaac’s art in mosaic one of these days. Goodness knows I have enough to choose from… Thanks for the inspiration! What a great idea, Kim! I’ve kept a lot of my kids’ drawings and have used a few as part of my own artwork. (Is that plagiarism?) The colors and creativity of kids always charms me. I love that you did this! 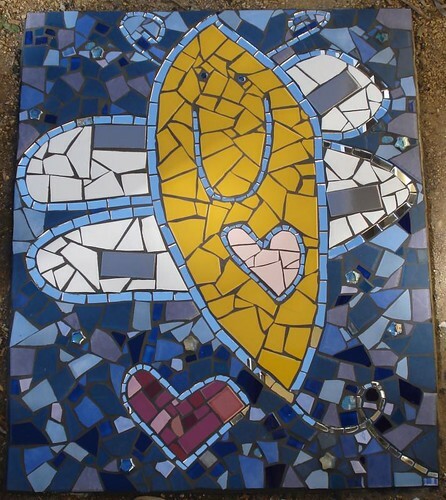 I love it – both the piece and the fact that you’re the mosaic “fabricator” of your daughter’s art. I love this. I can honestly say it’s the only time I wish I had children, lol – I love kid art & would love to have an excuse to make kid’s art into beautiful mosaics!